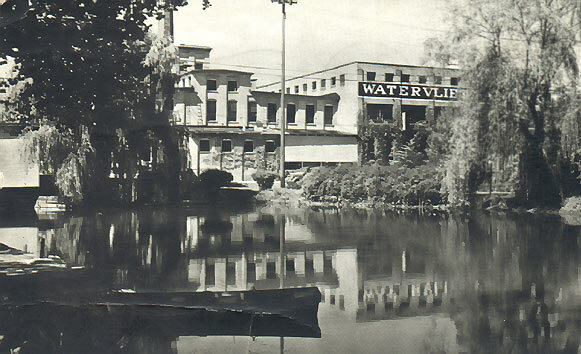 Watervliet's history is forever tied to the Paw Paw River ... The first person to begin a settlement of significance in what would become known as Watervliet, was a Mr. Sumner. 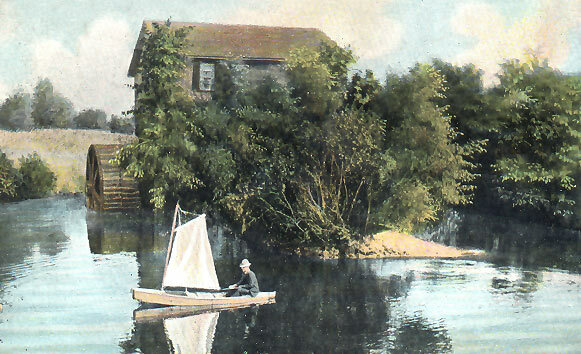 Sumner and a partner, Mr. Wheeler, built a sawmill on the Paw Paw River in 1833. This site was called "Waterford" in reference to the flowing waters of the Paw Paw River. In 1848, Merrick and Smith, current owners of the sawmill, sold the property to Isaac Swain. At this time, the sawmill was the largest lumber operation in the county. In 1849, a post office was established in the village with Mr. Swain appointed as postmaster. 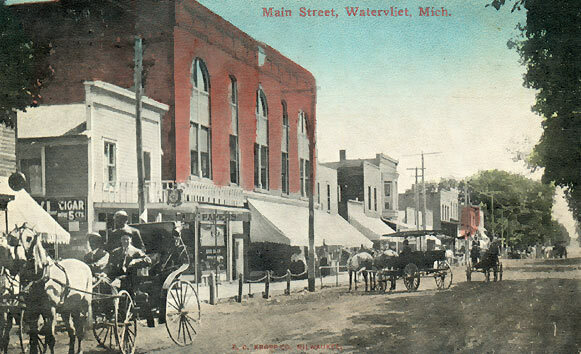 With the new post office, it became necessary to change the name of the village since another Michigan city had already claimed "Waterford". "Watervliet", a Dutch term meaning "flowing waters", was chosen instead. The town of Watervliet was growing and had expanded up the hill to the new Chicago and Michigan Railroad by the 1870's. In 1893, Sims and Dudley tore down the old sawmill, replacing it with a paper mill. For the next hundred years the paper mill grew into the town's main industry, employing 400 people over three shifts. In 1894, a new schoolhouse was built for $4,750.00 -- exclusive of the heating apparatus. 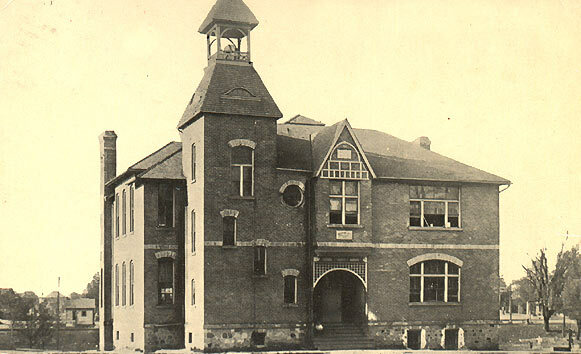 This sufficed until 1923 when a new school became necessary to accommodate the ever-expanding population. 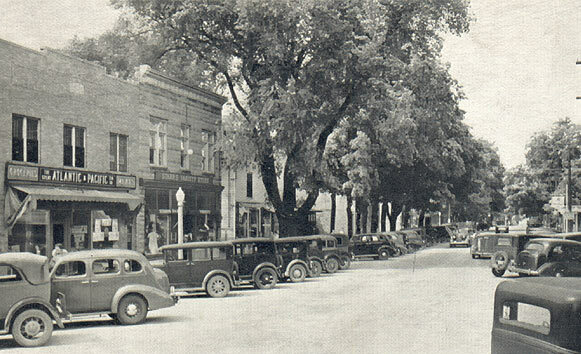 Watervliet was thriving and the Main Street reflected as much. With the timber industry coming to a close, farming became a lucrative replacement for Watervliet. One farmer, Harvey Sherwood, fast became known as the Apple King of Michigan thanks to Sherwood's 400 acres. In 1878 alone, 2,000 barrels of apples and 15,000 baskets of peaches were sent from the Watervliet train depot to Chicago markets. 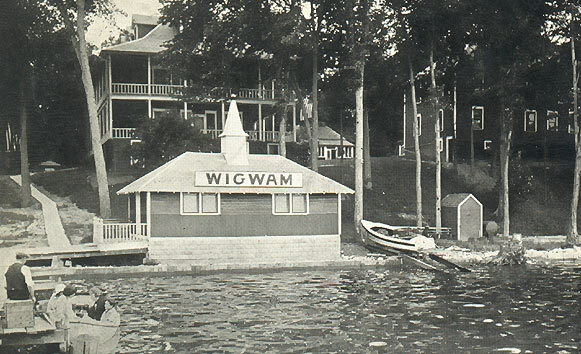 The depot also served as a gateway to the Watervliet side of Paw Paw Lake. For more than a hundred years, summer visitors filled Main Street on their way to the hotels, camps and cottages. Paw Paw Lake residents also made the trip by river to Watervliet on small passenger boats. We thank Rick Rasmussen of Southwest Michigan Store for the materials to create this chapter in Southwest Michigan History.